Googlemoogledotcom is the story of a girl named Juta who lives in the countryside at her granny’s. Juta is a totally ordinary girl but becomes involved in the most extraordinary adventures. When her sweet little guinea pig Possu falls ill, granny tries to make Juta and Possu feel better. An unbelievably colourful magical world opens up: in their adventures, Juta and Possu have to do battle against evil-doers and the just plain weird, win friends, find courage, and it all ends well – that is, Possu gets better. Google and Moogle yourself into a magical world with colourful adventures, music and theatrical magic! 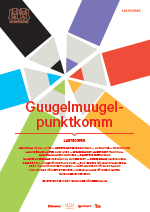 Guugelmuugelpunktkomm is a story about what happens after your switch off your mobile phone!